Posted on December 30, 2018 by Mike Sonnenberg Posted in Houses	. 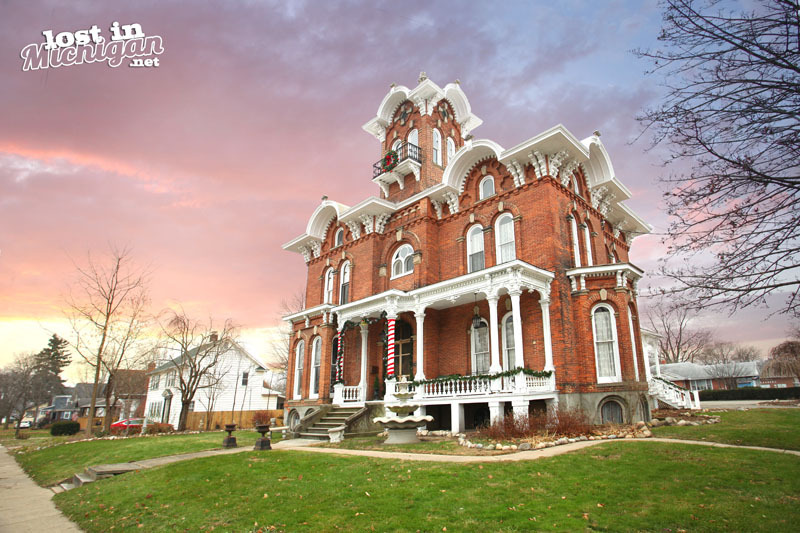 If you have ever traveled through the central Lower Peninsula on M-46 you have probably see the ornate Victorian mansion in St. Louis. The massive white wooden castle-like home was constructed by Colonel John Elwell. He invested in the Chicago, Saginaw, and Canada Railroad and made a fortune when he turned the company around after it had been struggling to make a profit. John Elwell rose to the rank of Colonel for his service to the civil war and he moved to St Louis in 1875. 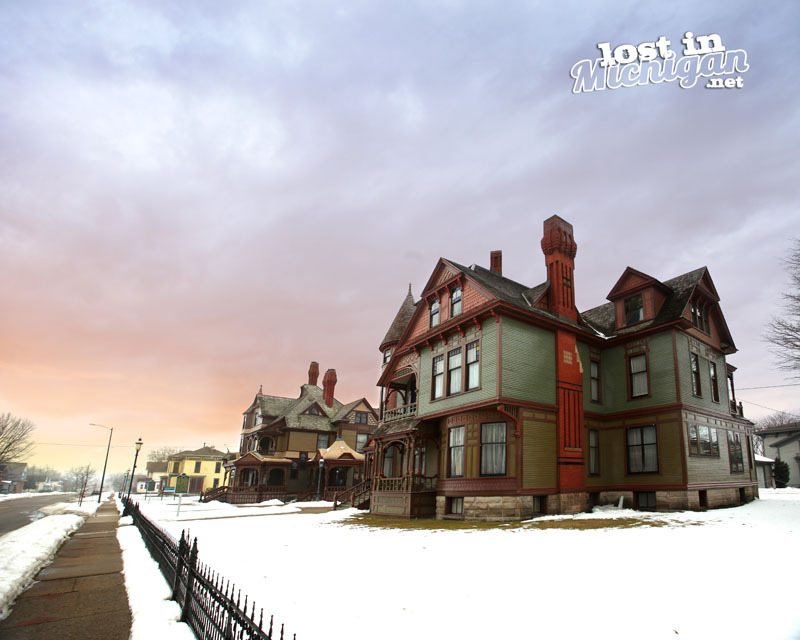 He purchased the whole block on Delaware Street in 1880 and finished construction of his elaborate home in 1884. He lived in the home until his death in 1910. P.S. I saw this house about 5 years ago on a trip to my son’s cross country meet and it inspired to do this website. I have been looking for old and interesting houses and places ever since. Posted on December 28, 2018 by Mike Sonnenberg Posted in Barns and Farms	. While I was out traveling the back roads north of Lapeer I came across the small community of Millville. 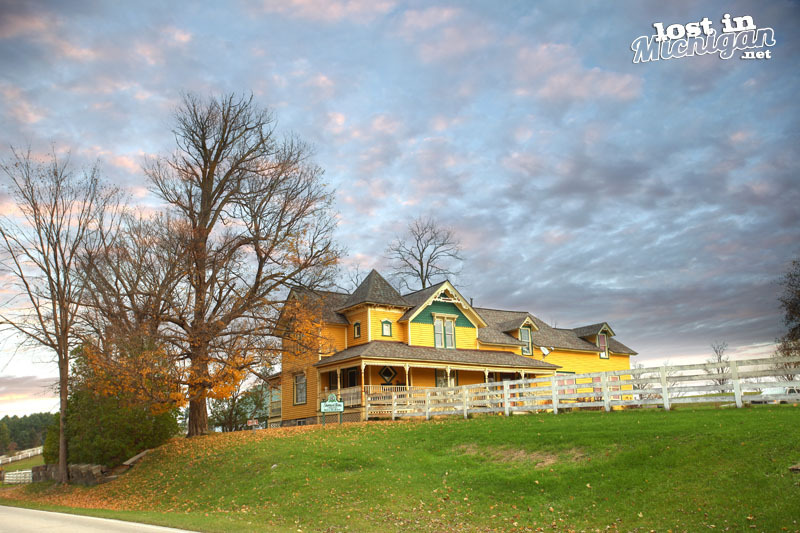 I saw this big yellow farmhouse on top of a hill and had to stop and photograph it. Posted on December 23, 2018 by Mike Sonnenberg Posted in upper peninsula	. I said the Christmas Mall not the mall for Christmas. 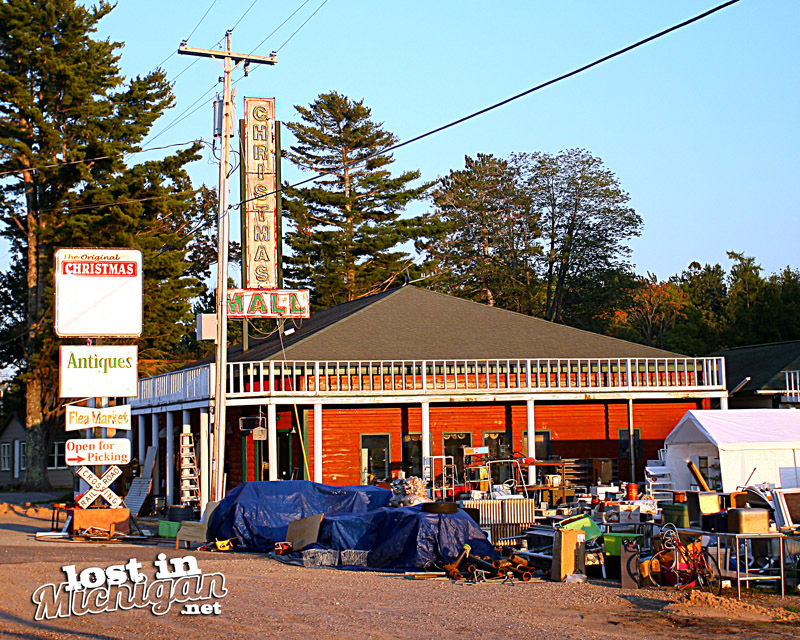 The little town near Munising got its name when Julius Thorton built a factory in 1938 to make holiday gifts. I am confused as to whether he named the town Christmas or his factory. Unfortunately, in the summer of 1940, his business burned down and he never rebuilt. although the workshop is gone the area still kept the name Christmas. The Christmas Mall was closed when I went by on my road trip. I like to stop at these eclectic shops to see what kind of stuff I can find, but I usually don’t have time since I am busy looking for places to photograph. I figure when I run out of sites to see it would be interesting to do posts highlighting some of these stores around Michigan. I see a lot of them all over the states, and mostly in small towns. P.S. If it seems like I am a little sporadic at posting over the holidays it’s because I will be spending time with my family. I hope you are fortunate enough to be able to enjoy time with your family. Thank you so much for taking the time to read my posts. I have lots of great stuff yet to post this winter. Posted on December 20, 2018 by Mike Sonnenberg Posted in Lighthouses, Murders	. Grand Island is in Lake Superior not far from the town of Munising. Most people are familiar with the East Channel Lighthouse with its weathered wooden siding looking towards the shoreline of the Pictured Rocks National Lakeshore. 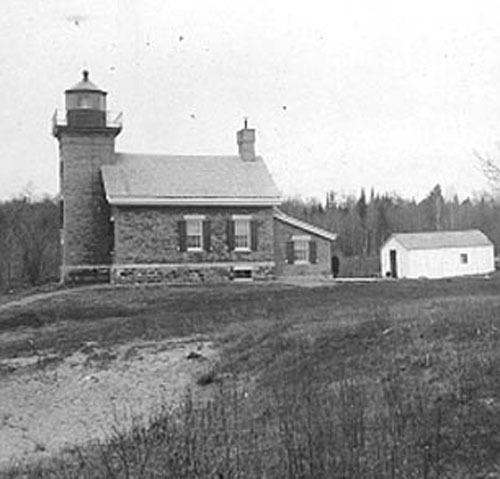 The old Grand Island Lighthouse sits on the northern edge of the island on a tall cliff overlooking Lake Superior. The lighthouse was constructed in 1866 to replace an old decrepit light that was built in 1844. In 1961 a metal post with a battery operated light replaced the lighthouse and it was decommissioned. Dr. Loren Graham, a history professor at Harvard, and his wife Patrica a historian and dean at Harvard purchased the dilapidated old lighthouse in 1972. While remodeling the old building they found a newspaper with an article about the body of the assistant lighthouse keeper being found in a rowboat floating offshore. Keeper Genry had also disappeared and it was 15 years later that his body was found washed up on shore 20 miles from Munising. After an investigation, it has never been determined what happened to the two men. Dr. Graham had researched the men’s mysterious death for 30 years and published a book detailing what he believed had happened to them. It is a fascinating book. In the middle of the book, he digresses into the history of the Upper Peninsula and the Native American culture and European mining immigrants. The book then circles back the death of the two keepers. Peoples culture and experiences lead them to believe what happened to the two men. Not only is the book a compelling mystery, but it is also a well written brief history of the Upper Peninsula. If you are looking for something to read this winter I highly recommend Death at The Lighthouse: A Grand Island Riddle which you can see HERE. I think it has been out of print for a while so you may have to get a copy from your local library if the bookstore does not have it. P.S. As far as I know, the Lighthouse still remains privately owned. I hope I get the chance to see it someday. Posted on December 19, 2018 by Mike Sonnenberg Posted in Houses	. South of downtown coldwater I saw this ornate brick mansion and in doing a little research I found out some history on it. The Italianate house was originally built by Alvin Lanphere. He was born in 1834, and manufactured lightning rods in Coldwater. In about 1870, he began work constructing this house. By 1875, the house was reportedly not completely finished, and Lanphere exchanged houses with Jacob Franklin Pratt who was born in 1829, and moved to Coldwater in about 1855. Pratt was part-owner in a tannery and boot manufacturer. 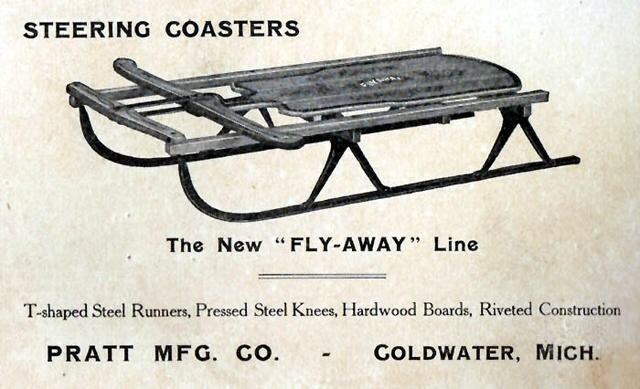 Later, Pratt founded the Coldwater Cutter Company, which manufactured sleighs and children’s sleds. Pratt lived in this house until his death in 1907. Pratt’s son, Allen J. Pratt, inherited the house, and also became president of the Coldwater Cutter Company. Allen Pratt lived in this house until 1933, when the firm went bankrupt during the Great Depression. After learning a little bit of the home’s history it makes me think of Rosebud. The house is still privately owned. P.S. I wish there was some snow on the ground of the “sled house” but it’s Michigan and I gotta deal with whatever weather we get when I am out exploring. I will have to take another trip back down to the Coldwater area in the winter and summer. There are a lot of interesting and historic places to see. Posted on December 17, 2018 by Mike Sonnenberg Posted in Train Depots, Uncategorized	. In 1891-92 the Chicago and West Michigan Railway, precursor to the Pere Marquette Railroad, extended the line between Traverse City and Petoskey through Spencer Creek. William Alden Smith, the railway’s general counsel, advocated the line through Spencer Creek, and in 1891 the town renamed Alden in his honor. Its location aided travel and shipping between Chicago and Petosky, supporting agriculture, lumbering and eventually tourism. The Pere Marquette built this depot in 1907 to replace one that burned in 1906. 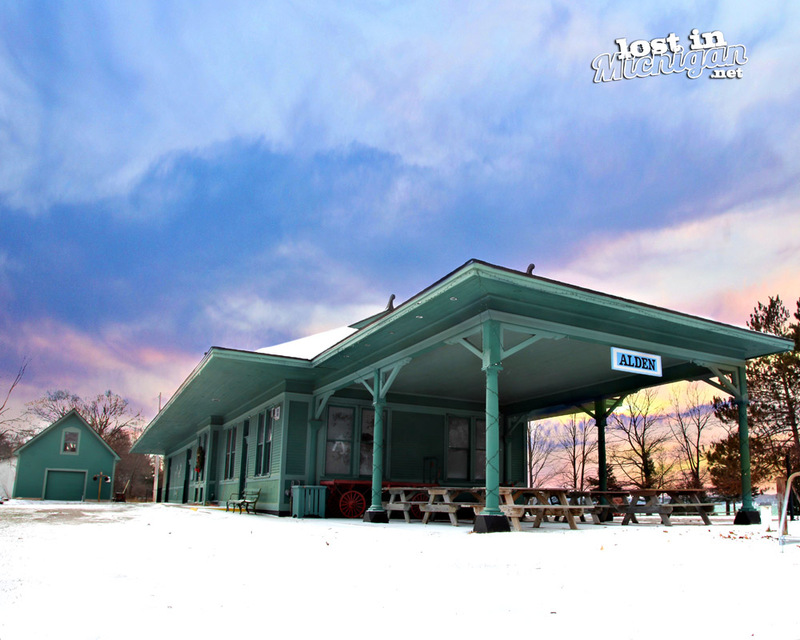 Northern Michigan newspapers called it the railroad’s finest depot north of Grand Rapids. In 1981 the last train left Alden. Helena Township acquired the depot in 1986. Posted on December 16, 2018 by Mike Sonnenberg Posted in cities	. The Purple Gang in Detroit was in control of the liquor that came in from Canada across the Detroit River into Michigan. If you wanted good quaily bottle of spirits from the distilleries in Canada you have to deal with the Purples. Two influential members of the Purple Gang, Sam Bernstein, and Louis Fleischer lived in Albion during Prohibition. They would meet with clients that took the train from Chicago to Albion at the Bohm theater. They sat in the balcony under the projector window to discuss business. The noise from the movie and projector would cover the sound of their conversations. 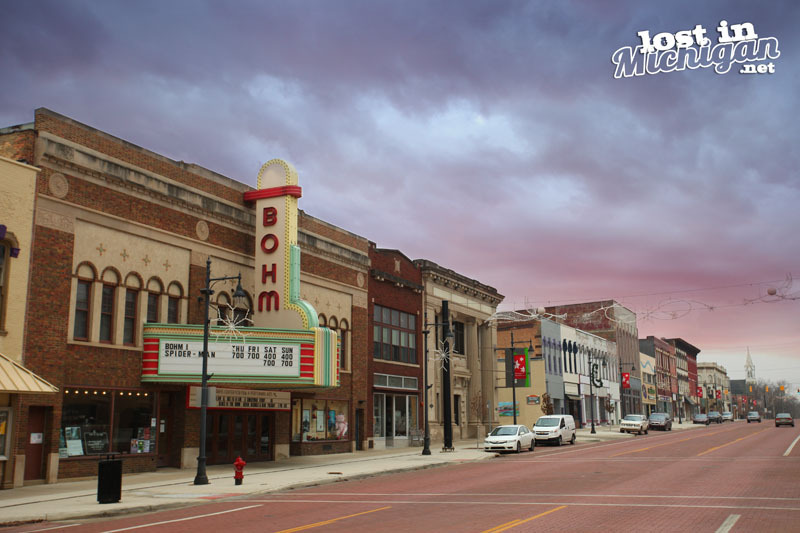 Prohibition has ended and the Purple Gang is gone, but the stories still linger along with the historic buildings in downtown Albion. Posted on December 16, 2018 by Mike Sonnenberg Posted in Churches	. 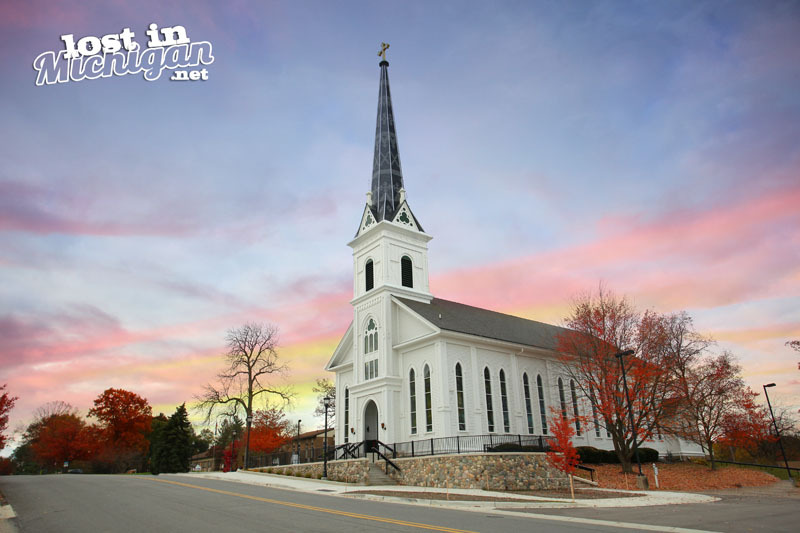 After the 1836 Treaty of Washington opened up the land for Europeans, Irish immigrants settled the area north of Grand Rapids. By 1844, it is estimated that 20-30 Irish families were settled in the area now known as Parnell. The town was named after Irish political leader Charles Stewart Parnell. The community came together to worship with a priest sent from Grand Rapids, most frequently in the home of Michael Farrell. By the end of the 1840s, planning for St. Patrick’s Catholic Church had begun. The original church was replaced by two other churches that burned down. The current structure and fourth church to be given the name Saint Patricks was built in 1878. It was renovated in the 1990s and still stands proudly over the farm fields surrounding Parnell. Posted on December 15, 2018 by Mike Sonnenberg Posted in Uncategorized	. Thank you all so much for your kind comments about my books. Many people told me they loved reading them and keep them in their car for places to visit on trips around the state. Posted on December 14, 2018 by Mike Sonnenberg Posted in Houses	. Thomas Hume arrived in Muskegon from Ireland in 1870. In 1872, he joined Charles Hackley’s lumber firm as a bookkeeper. Charles Hackley and Thomas Hume became partners In 1881 creating the very successful lumbering firm of Hackley and Hume. In 1887, Hackley purchased a series of lots on the corner of Webster and Sixth. He immediately sold one and one-half of these lots to Thomas Hume, and then constructed his own house on these lots. Hume engaged architect David S. Hopkins (who also designed Hackley’s house shown in the background) to design his home. It was completed in 1888. The Hume family expanded the house after the turn of the century, adding a library, dining room, and sleeping porch.